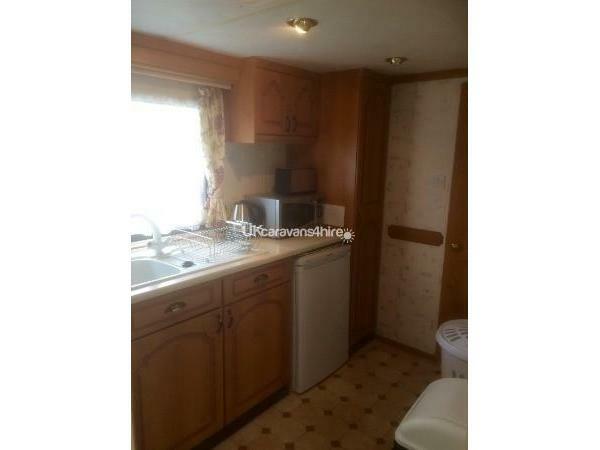 Our beautiful 3 bedroom static caravan for hire on Hopton Holiday Village features heating in all bedrooms and the bathroom. A small side decking and a bench seat has been added for 2018 season. All soft furnishings, carpets and curtains have been renewed this season. 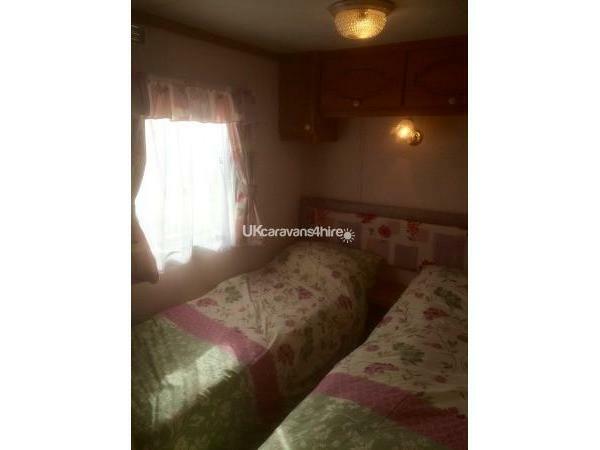 The caravan can accommodate up to 6 people with 1 double bedroom and 2 twin rooms. 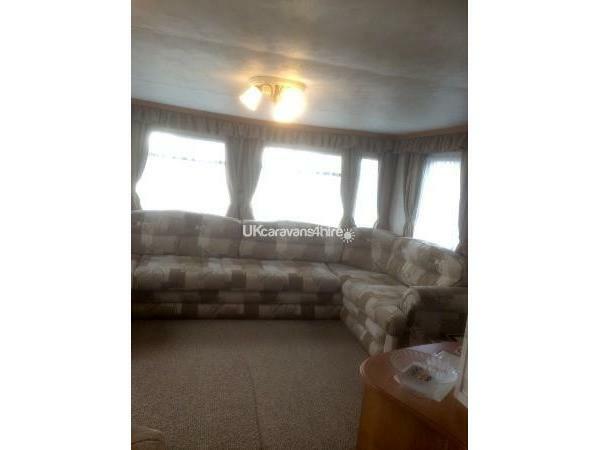 It is very spacious (37ft x 12ft). You can relax and enjoy your holiday with many modern comforts such as Freeview TV/DVD and video/videos, DVD's, radio/cd player, books, games, hairdryer, toaster, microwave, cafetiere and lots more . 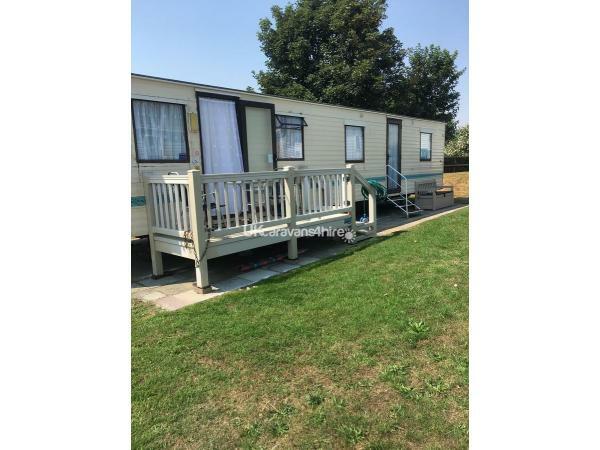 For those sunny days there is an outdoor table and chairs for you to sit out on the decking or on the grassed areas in front or behind the caravan. 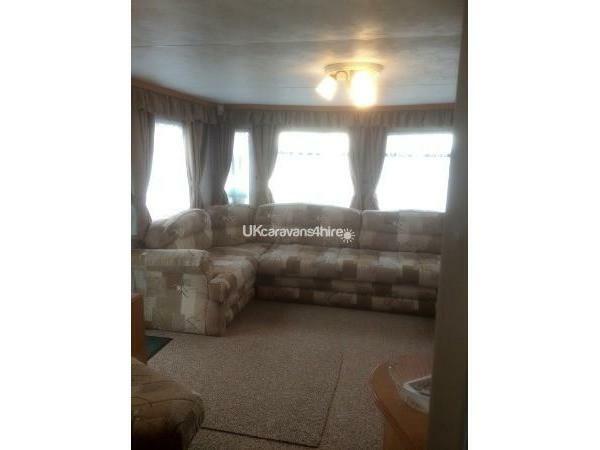 There is also a bench seat in front of the caravan for you to relax while the children are playing. Experimental - join the mad professor for this interactive event and find out just how exciting science can be. Other entertainment includes ;- Cash Bingo, Game shows - Go Live, Go Tots, Go Win, Seaside Squad adventures, Seaside Squad Pop concert. Prize Bingo. New shows for 2018:- MusiKids: school's out, Carnaby to California, Sweet Soul Music. Also Welcome to Glamrock, Go Solo-the funstars go solo to entertain you. Visiting acts;- from musical tributes to live bands, magicians and stand up comedy. Certain Shows and Guest appearances will not be on every week. Haven reserve the right to change the entertainment at any time without notice. Passes are required for the onsite facilities, these are NOT included in the cost of your caravan holiday. The holiday park is located between the towns of Great Yarmouth and Lowestoft, just off the A47 (formallyA12). Running alongside Hopton Holiday Village is half a mile of sandy beach, just 3 minutes walk from our caravan. If you are looking for somewhere that can provided lots of entertainment for all ages then Hopton Holiday Village is a great place for a caravan holiday. During the day and evening there is a full entertainment programme, plus kids clubs for children of different ages. 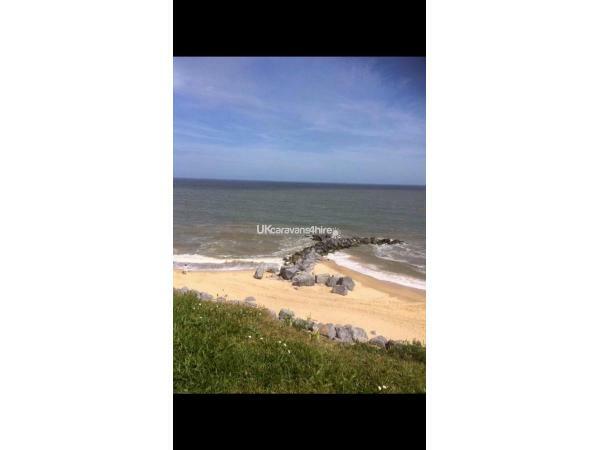 Enjoy the outdoors why not join in Nature Rockz at Hopton your kids will enjoy finding out more about the countryside from exploring the park and coastline to finding out all about the wildlife that live in and around it. There are also some great activities that might inspire your kids to become the next Bear Grylls including :- animal tracking, Foraging, Leaf art, paint a plant pot, Pebble art, RNLI explorer, stick creatures, water purification, fire lighting techniques, go explore, grass head creations, nest box creations, pirate treasure hunt, recycled creations, ranger bug hunt, ranger nature trail, ranger pond dipping, sand sculptures, survival bracelets, survival shelters, wild birds and bird feeders (charges may apply for some activities). Family fun is provided in the evenings with prize bingo, fun and games. Early on the entertainment is focused on the children with adult entertainment such as live cabaret and shows by your resident team provided later on in the evening. Hopton Holiday Village is situated approximately 2 miles from Pleasurewood Hills American Theme Park, a great attraction that is suitable for children and adults. You will also find the Norfolk Broads and Oulton Broads within easy reach. Nearby you have lots of places to visit during your caravan holiday. These include the Pleasure Beach at Great Yarmouth, the Winter Gardens, Sea-Life Centre, Fritton lake country park, perhaps a day out at Sandringham or even Thrigby Hall wildlife park. Why not visit The Oulton Broads or go for a boat trip on the Norfolk Broads. Greyhound Racing and the Great Yarmouth Racecourse, stock car racing . If you are interested in animals you can take a sea trip to Scroby Sand to see the seals or a short 15 minute drive will take you to the Suffolk Wildlife Park. Review: "We had a great time at Hopton, the caravan was a great size and very clean and comfortable. We were a group of seven so needed the larger caravan. Marian was most helpful and we have already rebooked with her again. 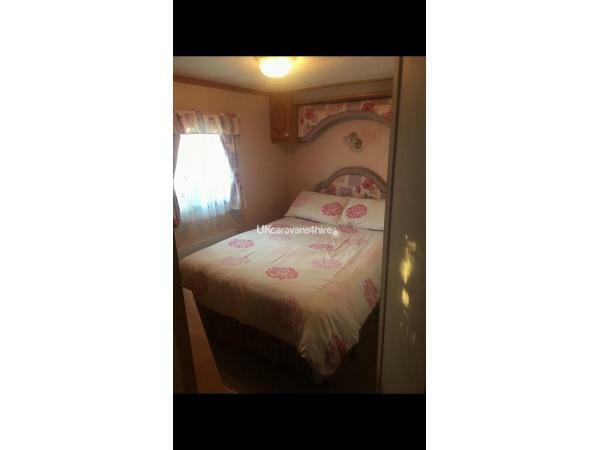 Sarah Clarke"
Review: "Great park and lovely comfortable caravan. We hired the bed linen which was beautifully laundered. The caravan was kept very clean and we were very happy during our stay. We will be booking with Marian again." 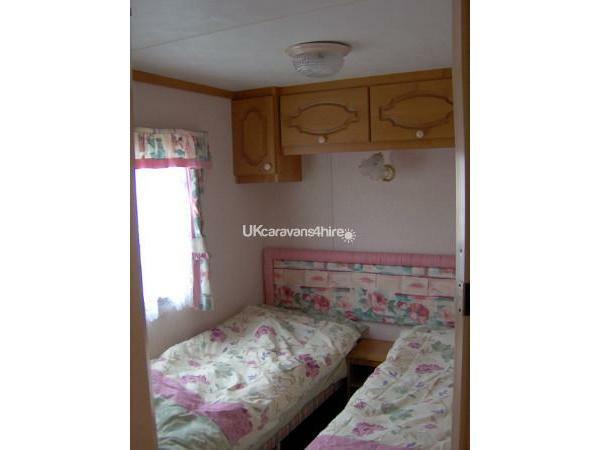 Review: "This was our 3rd year with Marian’s caravan and as always everything was kept clean and up to date. A nice caravan close enough to the complex not to have to walk miles, but not too noisy either. We will of course be returning next year. Thank you, Marian"
Just had a fantastic week in Marion's caravan. Everything you could possibly need is in the caravan. The position on site so close to the beach and site amenities is brilliant yet still remains peaceful. Kids loved the onsite swimming pool and entertainment. We will definitely be back. Thank you. We have stayed in numerous caravans and this one on offer from Marian has to be one of the cleanest, most well equipped and situated vans we have ever used. Spotless and very quiet whilst being close to the heart of the camp. Very easy to book, fast communication and Marian is a very welcoming and friendly host to work with. 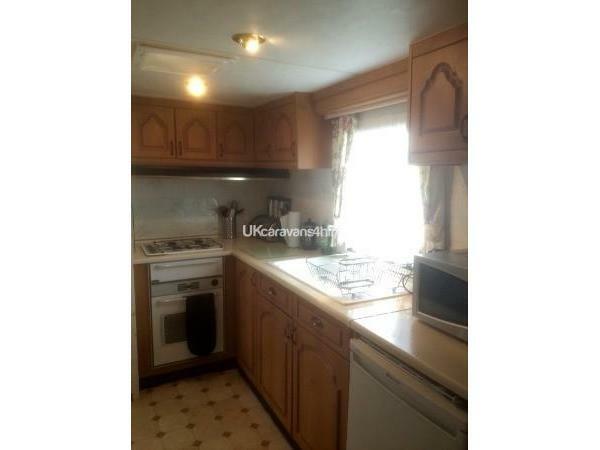 We cannot recommend Marian and her caravan highly enough. Book with 100% confidence, we certainly will again! Hi Marion thanks for your help with hiring the van for my son and family.I collected the keys and was delighted with The cleanliness and facilities provided .The bed linen was lovely’.Darren and Sally were pleased with the van and enjoyed their stay with there son.We would recommend your caravan to others. We had a lovely break in Marian’s van. It’s in a nice quiet spot with no traffic car or foot passing as it’s tucked away but still close to all amenities. It is kitted out with every possible thing you would need for a holiday, games and dvds for a rainy day, toys for the little ones,there was tea and coffee jam marmalade little things that you would not expect to see. We hired her linen which was immaculate, all in all a very nice van at a reasonable price. Will definitely be booking for next year. Thank you Marian we had a fantastic stay in your caravan it is spotless and has everything you need and more its amazing what is provided in your caravan you thought of everything an so very homely.loads space around caravan to sit out or if you got a daughter like ours do gymnastics. This was a very last minute booking night before holiday and Marian made it very stress free such a lovely helpful lady nothing was to much. Such a pleasure to deal with we will definitely come back and i wouldn't hesitate to recommend. Hopton Haven itself very clean and lovely friendly staff great site loads to do. Thanks again Marian you provide A* service. 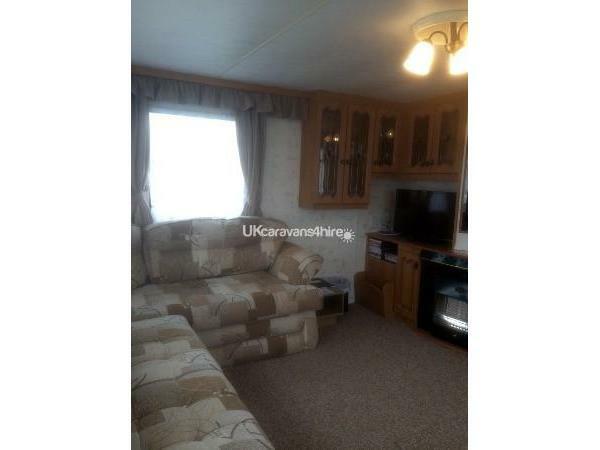 Had a nice time in this caravan, it was fully equipped with every you needed. For the price, it was excellent value for the money. Marian the owner provided us with a first class service. 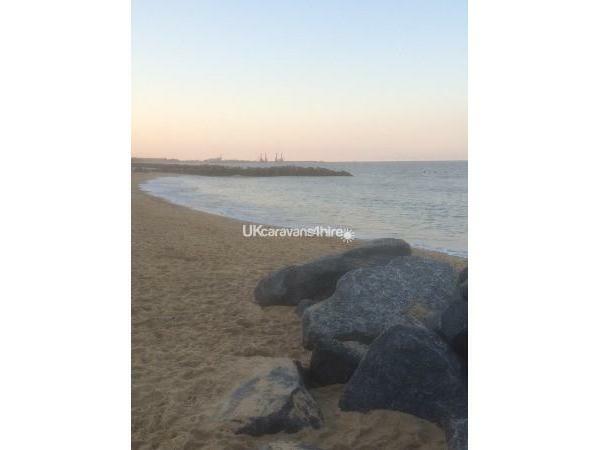 Not knowing what to expect as it was our first holiday in a caravan, we were very impressed with the location, the area of hopton and great Yarmouth, and the facilities on the camp site itself. We enjoyed a lovely sandy beach just a short walk away which had lovely view along the way. The immediate beach to the campsite was closed but there was a complimentary bus available. All dealings with the owner had been prompt, friendly and efficient. The caravan was situated close to the clubhouse and laundry but not too close that guests voices disturbed us and we weren't overlooked. We would defiantly look to return again. Home from home ! 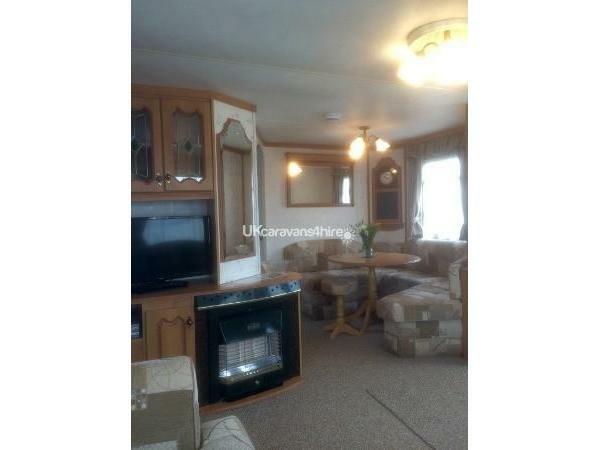 Can highly recomend this well equipped comfortable caravan. The owner Marion Barnham goes that extra mile to make sure you have the best holiday! Thanks Marion for another fantastic holiday at Hopton.